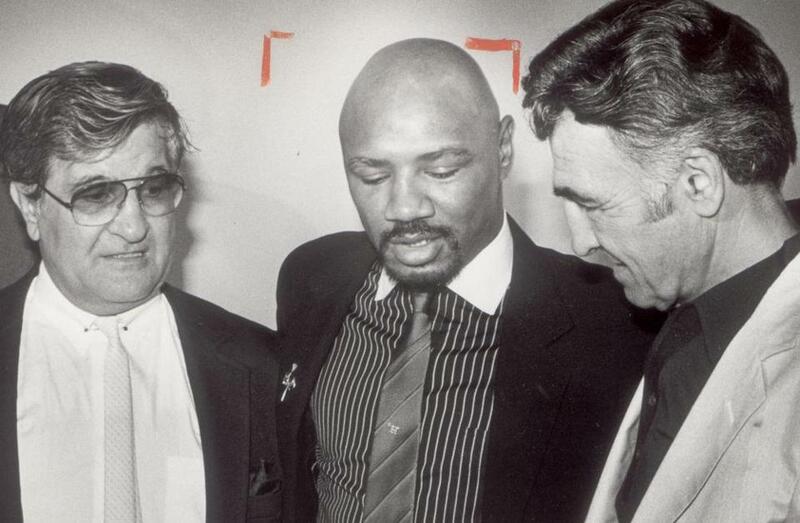 Goody Petronelli (right) and brother Pat (left) steered Marvelous Marvin Hagler all the way to the middleweight title. Brockton boxing trainer Guerino “Goody’’ Petronelli, who worked with middleweight champion Marvelous Marvin Hagler, died Sunday in Bourne, apparently of natural causes. He was 88. Petronelli and his brother Pasquale “Pat,’’ who died in September, opened a gym in 1969, discovering Hagler as an amateur after he moved to Brockton from Newark. The brothers set up construction jobs for Hagler, who remained loyal to them during a frustrating period when they struggled to arrange a title shot for him. Finally, seven years into his professional career, Hagler won the middleweight championship, defeating Alan Minter at Wembley Arena in London in 1980, holding it through a controversial split decision loss to Sugar Ray Leonard in Las Vegas in 1987. Goody Petronelli, born in Brockton in 1923, had a successful amateur boxing career in the US Navy. The Petronellis were contemporaries of undefeated heavyweight champion Rocky Marciano - who was born a month before Goody and also began boxing in the Navy - and followed the tradition of Marciano’s trainer, Allie Colombo. They began working with fighters at their gym in 1969, the year both Colombo and Marciano died in separate accidents. The Petronellis’ father and Marciano’s father both hailed from the Abruzzo region of Italy and their sons grew up close friends. One of Goody’s favorite stories involved how he tried to persuade Marciano not to pursue a boxing career. After returning from World War II, Marciano said, “I’m thinking about turning pro,’’ Goody’s nephew, Tony Petronelli, recalled yesterday. “And Goody tried to talk him out of it. He said, ‘You know, Rocky, it’s a real tough game.’ And Rocky said I think I’m going to give it a shot. Goody is talking to probably the toughest guy in the world and telling him it’s a real tough game and you’ve got to think about it, Rocky. Goody did most of the hands-on training of fighters, donning gloves and sparring with them, accompanying Hagler while he did his roadwork in Provincetown. Both brothers were technically manager/trainers, but Goody focused on the gym work and used his Navy medical experience as a cut man in the ring, while Pat emerged as a negotiator. Their work with Hagler launched the Petronellis to high-profile status and they spent time in the company of celebrities in Las Vegas and Palm Springs, Calif., where Hagler trained. After Hagler’s retirement following the Leonard fight, the Petronellis guided others who would fight in world title bouts: World Boxing Organization super middleweight champion Steve Collins; Hagler’s brother, US Boxing Association middleweight champion Robbie Sims, who lost to Sumbu “Patrizio’’ Kalambay in 1988 for the World Boxing Association championship; and Malawian light heavyweight Drake Thadzi, who lost to Virgil Hill in a WBA title bout in 1995. The brothers also trained Pat’s son, Tony, who won the North American Boxing Federation light welterweight title in 1976; New England super featherweight champion Mike Cappiello; Massachusetts middleweight champion Mike Culbert; and Kevin McBride, whose TKO victory ended Mike Tyson’s career in 2006. They also worked with heavyweight Peter McNeeley early in his career. The brothers’ gym, located on Petronelli Way in Brockton, closed last year, Goody moving the operation to Stoughton. Goody was married for 67 years to Marian (Gorman) Petronelli, who died in October.